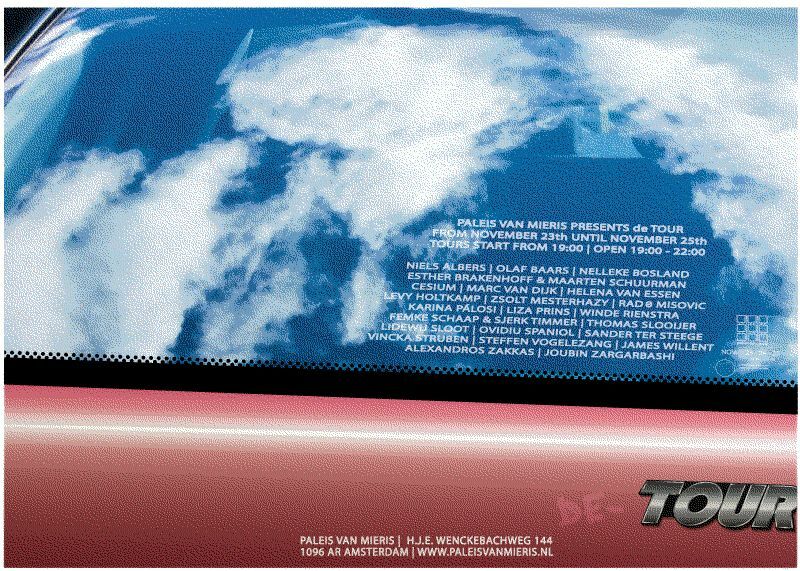 Paleis van Mieris gladly announces de-TOUR and invites you for a guided tour through a multitude of situations created by 25 artists. A three evening event that runs parallel with the Amsterdam Art Weekend. 23 – 24 – 25 November from 19:00 – 22:00. First guided tour starts from 19:00. Selection from 60Seconds Short Film Festival: Jens Axel Beck, Rasmus Riemann, Evalajka Pervin, Maria Gondek, Oana Constantineanu, María José Alós, Roland Wegerer, Alexandra Mocan & Nicolae Romanitan, Verika Kovacevska, Fernando Baena. From Leap Second Festival: Agam Andreas, Alan Sondheim, Alexandra Andries, Amelia Johannes, Ana Buigues, Anne Niemetz, Ayshe Kizilcay, Bence Rohanszky, Bjorn Magnhildoen, Bruno Melo, Chris Funkhouser, Christian Boen, Cleber Gazana, David Whitcraft, Dennis De Bel, Dom Barra, Domenico Barra, Dominik Podsiadly, Edoardo Gaudieri (det0une), Eleonora Roaro, Esther Polak and Ivar van Bekkum, Frere Reinert, Hande Zerkin, Heidi Horsturz, Igor and Ivan Buharov, INTERLICHTSPIELHAUS, Irena Kalodera, Jules Varnedoe, Jurgen Trautwein, Justyna Kabala, Karina Mitchell, Kyriaki Goni, Lau Ching Wa Jess, Leap Second Festival, Lorna Mills, Martin Howse, Matt Vogel, Matthias Hauan Arbo, Mauricio Sanhueza, Miriam Poletti, Nenad Nedeljkov, Nick Mattan, Nico Vassilakis, Nigel Roberts, Pasha Radetzki, Patrick Lichty, Paul Wiegerinck, Pawel Wocial and Kamila Tuszynska, Ria Puskas, Sarawut Chutiwongpeti, Sherwin Altarez Mapanoo, Simon Coates, Simon Perathoner, Sissel Berntsen, Theodora Prassa, William Wolfgang Wunderbar with Sacha Toncovich. Buluntu Görüntü ile Video Kolaj atölyemizin 4. Buluşması için yrn saat 18:30‘da @kirkmerdiven’de buluşuyoruz. 6 Şubat 2017, pazartesi akşamı gerçekleşecek olan video gösterimimize tüm İzmirli dostları bekleriz.